The official "APEC 2013" mobile application for your Nokia Lumia with Windows Phone 8 is here and now is available at Windows Phone Store just for free. 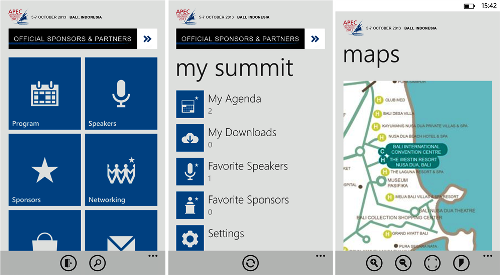 The official "APEC 2013" mobile application will guide you to the APEC 2013 CEO Summit that will be held from 05-07 October 2013 in Bali, Indonesia. A lot of information available on this application such as full CEO Summit Schedule, Speaker and moderator information, Event information and many more. Using this application require a username for log in.